Do you sometimes look out at your class and wonder if the students are REALLY 'getting' what you're saying? Have you ever given a test or exam and been surprised that the scores were lower than you anticipated? In this workshop, tools and techniques will be shared for taking a 'temperature check' of your students' learning. Participants will be presented with quick, simple, effective ways to assess what information has been absorbed and what content needs to be restated or presented in a slightly different way to increase student learning. Whether you're teaching art history or finance, accurately evaluating your students' understanding and confusion during class will make you better able to tailor your lessons to increase learning for everyone. 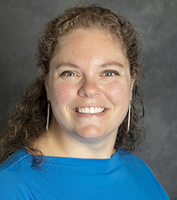 Angela Adams is a twenty-year classroom veteran who has taught Science, Social Studies, and Literacy to middle schoolers in the Upstate, Lowcountry, and Midlands of South Carolina. Adams earned a B.A. from Clemson University and an M.Ed from Southern Wesleyan University. She is a former district teacher of the year and is certified in Elementary Education and Middle Level Science as well as being National Board Certified in the area of Early Adolescence: Science. Adams has presented professional development sessions to groups of teachers at the school, district, and state levels. Currently, she is coaching 19 first-year teachers through the College of Education's Carolina Teacher Induction Program (CarolinaTIP), sharing her own enthusiasm about being in the classroom in the hopes of increasing teacher retention and efficacy.